Our work encompasses tarmacadam construction & resurfacing and also various ancillary works, including drainage, line marking, ground works & landscaping. Full construction and resurfacing of carriageways, footways, cycle lanes, bus lanes, car parks and driveways. We can also offer you a number of different surfaces for the above - see our Surfacing Products page for more information. Playground Surfacing and Resurfacing - We are one of the leading contractors in the London, Surrey and other Home Counties for supplying safety surfacing. We also supply and lay wheelchair accessible surfacing for commercial and residential playgrounds. Sports Surfaces - We can lay specialised products such as Leisuretex and Courtmaster. Approachability - We know that clear communication and integration - within the Company and with clients, partners and contractors, is vital to enable success in the future. Paving Contract Works - As experienced paving contractors we can provide block or brick paving in various styles & colours, supplied by all the major stone merchants. Road Sweeping - We own our own road sweepers. Crash Barrier Installation - We can supply and install height-restriction barriers, parking posts and bollards etc. Groundworks - As part of a surfacing contract we can undertake small areas of landscaping, including the laying of turf and the planting of small trees, bushes, shrubs and plants. We can also help with your transportation conundrums by using our Low-loader to move your bulk loads wherever you require. Our Volvo cab & Kinshofer trailer can transport plant, vehicles & other bulky loads to your destination. CONTACT OUR HEAD OFFICE FOR RATES. Geographically, we cover the Home Counties (Surrey, Kent, Essex & Middlesex) as well as Berkshire, Buckinghamshire, Cambridgeshire & Oxfordshire. 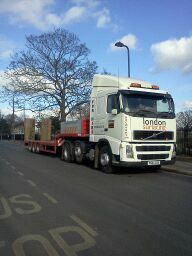 We also undertake works in all the London Boroughs within the M25 orbital.